One of the key reasons for this trip was to attend a three-day magic convention, aptly named SAMagic2015. Such conventions offer a great opportunity to mingle with others of my ilk (ie: the socially awkward and introverted), while also learning from world-class magicians from across the globe. With all these elements combined, it is easy to become reinvigorated and to find new inspiration and ideas, as well as to make new friends and contacts. 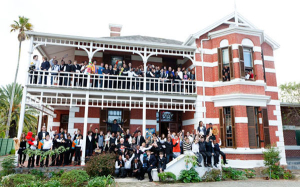 What most people do not realise is that Cape Town is also home to The College of Magic – a non-profit organisation dedicated to inspiring and uplifting young people through the art of magic and performance. Established in 1980 with just over 30 students, the College has now been operating for 35 years, boasts around 170 students, and is the only organisation of its kind in the world. I was lucky enough to be given a tour of the College, along with the lecturing magicians who had all come from abroad. The College itself is a beautiful double-storey Victorian homestead, built in 1899, and immaculately maintained since that time. Within its walls you find auditoriums, rehearsal rooms, a small museum, a library, media centre, video editing facilities, a canteen, a workshop for building illusions, a magic shop, and more. It’s a building that would fascinate young and old alike, regardless of ones inclination towards magic. Cape Town College of Magic. While students vary in age, ethnicity, and background, many come from abject poverty, and face overwhelming odds. As the College’s website states, “these students’ lives are blighted by a landscape of hopelessness and destitution, forever in the shadow of violent crime and HIV”. It is in this context that one can see how this amazing College can offer a great deal of excitement and hope to many students. In addition to learning the theory and practice of magic, students also find “improved confidence and self-esteem, individuality, respect, self-discipline, creativity, and the hope to achieve their dreams”. In short, they learn life-long skills that can be holistically applied to other areas of their lives. At the end of this article I’ve included a nice little CNN video about the College, which shows better than I can, exactly how the college inspires and helps people. One of the teachers at the College is local magician Stuart Lightbody – one of the finest magicians I’ve ever known, and a person I feel truly honoured to call a friend. Stuart himself attended college as a student from 1997 until 2001, and has now been teaching there for over ten years. As a former student, Stuart Lightbody has gone on to perform original one-man shows at Festivals around the world, where his shows are always met with both awards and critical acclaim. For sharing his time and knowledge at the College, Stuart receives no financial reward. He teaches there solely because magic is his passion, and because he can see the good that the College of Magic does. During SAMagic 2015, I was able to enjoy the South African magic competition, which included categories for both stage magic and close-up/parlour magic. As you might expect, many of the competitors were either students or graduates of the College, and all showed incredible creativity, passion, and talent. Unsurprisingly, and completely deservedly, Stuart Lightbody again won the title of South Africa’s ‘Best Close-up Magician’! (A video of Stuart can be found at the end of this article). The category for Best Stage Magician was awarded to recent graduate, Olwethu Dyantyi, who had just recently returned from performing his act dozens of times over a week in Beijing. 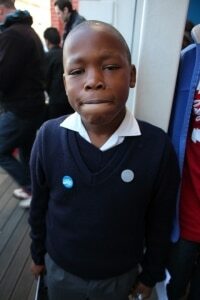 Olwethu’s ease on stage, and his incredible skill, suggest to me somebody who is really going places. Already he’s a truly world-class manipulator (in the magical sense), and by my guess, is not yet even in his 30s! (Yet again, a video is included at the end of this article). While obviously not all students will have this level of dedication or find this level of success, these two examples show just what can be achieved with passion and hard work. I have to say, magic is alive and well in South Africa, and I believe the College is a huge part of the reason for this! Magic has given a great deal to me over the past five years, and its nice to give a little back, albeit a long way from home. For anyone interested in the arts, and for anyone who can understand the greater good a place like the College can offer, please do consider sponsoring a future star, or simply giving a donation. Congratulations, splendid fellow – your attitude and your contribution are as inspiring as is the Cape Town Magic place. Loved reading all about it. And just the best to see you thriving, Rob, doing what you should be doing in life.